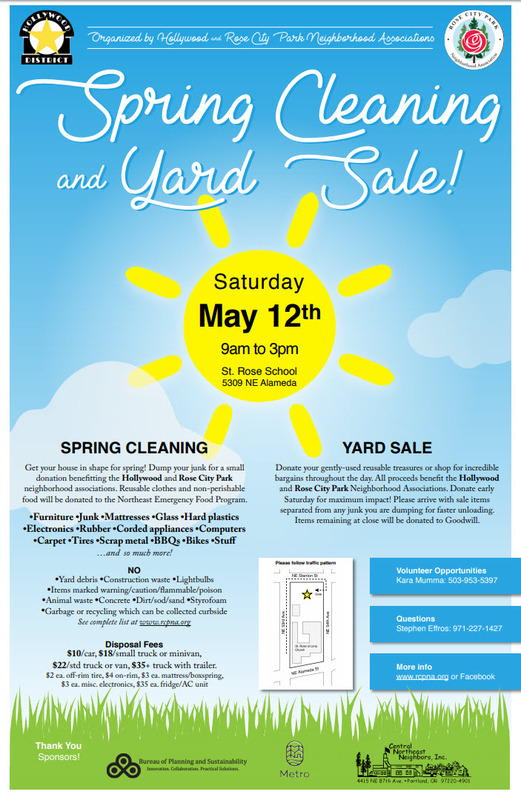 Every year the RCPNA and Hollywood neighborhood associations co-host a “Spring Cleanup” event. For 2018, the cleanup event will be on Saturday, May 12, 9:00 am-3:00 pm. You can bring that unwanted trash from your house, basement and garage to the parking lot of St. Rose of Lima School and Church (54th and Stanton) for drop off and maybe find your next treasure too at our rummage sale. 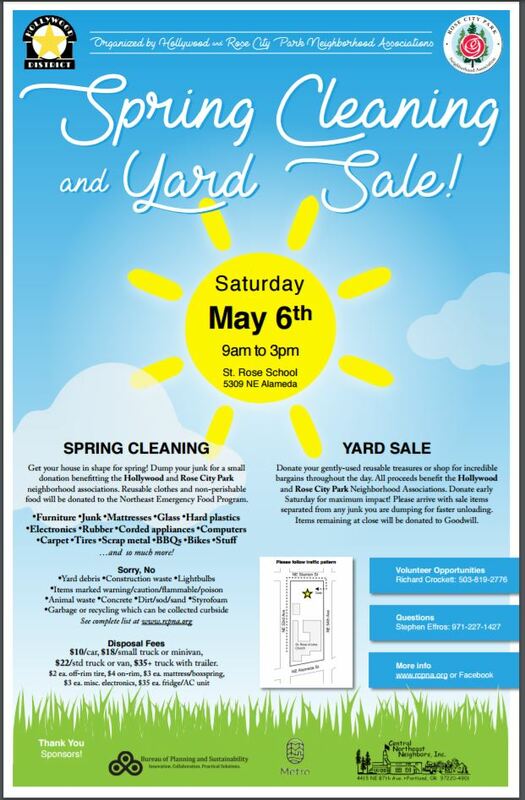 Please DO take advantage of this neighborhood opportunity to get rid of unwanted stuff! Furniture, Mattresses, Glass, Hard Plastics, Electronics, Rubber, Corded appliances, Computers, Carpet, Tires, Scrap metal, BBQs, Bikes… Junk! For 2017, the cleanup event will be on Saturday, May 6 from 9:00 am to 3:00 pm. You can bring that unwanted trash from your house, basement and garage to the parking lot of St. Rose of Lima School and Church (54th and Stanton) for drop off and maybe find your next treasure too at our rummage sale. This is a great way to give a little back to your community (and honestly it’s a lot of fun). No experience or skills needed — just show up and help us process the cleanup for your neighbors. Come for a couple of hours or for the whole day. Teens looking for service credits welcomed! Each volunteer will need to sign this waiver as well. Please print and bring with you if possible. We will have some extra copies if not. Please see our 2017 Cleanup Intake Form for guidance on what can be accepted this year.